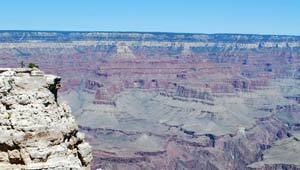 The Grand Canyon is huge and different parts of the canyon give you differing views. Most trips from Las Vegas take you to either the West Rim or the South Rim. The West Rim is the nearest to Vegas and is effectively the western edge of the Canyon before the Colorado River flows into Lake Mead. It’s here that you’ll find the glass “Skywalk” which curves over the edge of the West Rim. There are shops, eating areas and viewing areas here too. There’s no doubt that the Canyon here is impressive to see, but we’d recommend paying a little more and seeing the South Rim. This is where most of the pictures of the Grand Canyon you’ll have seen are taken, and we think the views are much better. This is mainly because the canyon is far wider and the erosion of the rock has many more colour layers. There are various viewing areas on the South Rim including the newly refurbished Grand Canyon Visitor Centre where the photos on this page are taken. Your next choice is what mode of transport to go for to get there. Going by coach is usually the cheapest way, but you need to consider journey times. To the West Rim you can expect to be on the coach for 3 hours, but to the South Rim it’s more like 5 or 6 hours. Journeys are often broken up with a stop at Hoover Dam and there’s often Breakfast and lunch included. A better, but more expensive option is to go by air. Many Grand Canyon air companies fly from Boulder City Airport near to Hoover Dam. Flight times from Boulder City are around 30 minutes to the West Rim and around 1 hour 15 minutes to the South Rim. Both rims have a small airport, so many air tours touch down and allow you to see the Canyon from the ground as well as the air. You can fly from Las Vegas to the Canyon too which cuts out the trip to Boulder City, but increases flying time. Most companies offer “High Wing” aircraft with large viewing windows so you can have an unobstructed view of the scenery. The other air alternative is helicopter and they can do what planes can’t by taking you into the Grand Canyon itself. Bear in mind that helicopters have a lot of glass to look through, but if you’re in the middle seats, you’ll have to look past someone else to see. If you can afford it, we’d recommend one of the combination tours on offer. These are becoming more and more popular and you can now explore the Canyon in many different ways on the same trip. The most common combination tour you’ll find is an air flight to the Canyon, followed by a bus tour of photographic locations before flying back. Other combinations include helicopter flights to the Grand Canyon floor, rafting on the Colorado River, horse riding on the Canyon floor etc. Remember that when you start to look at combinations, prices start shooting up!